Let’s keep the good times rolling and get into this week’s picks. At the current line, this one makes me a bit nervous. I felt much more comfortable at the beginning of the week when this one opened at -7.5, then stuck around -6 for much of the week. But, as they always say, “fortune favors the bold.” I expect Middle Tenn. State to take advantage of the Marshall secondary. There is no doubt that MIchigan St. is a talented team, but they have not put it together yet. Before getting into the toughest part of their schedule, the Spartans need to make a statement win. This is exactly the spot. Northwestern is in a hangover spot after playing Michigan close last week. This line finally moved off the -10 spread, so take the -9.5 while you can. It’s Homecoming Weekend at Heinz Field, while I doubt there will be much of an atmosphere (ALL COLLEGE STADIUMS SHOULD BE ON CAMPUS), I do expect the Panthers to come ready to play, keep this one close, and possibly squeak out a win. Last week, Syracuse was up on No. 3 Clemson entering the fourth quarter. Meanwhile, PITT was getting clobbered by No. 15 UCF. Syracuse has bettors all the reasons in the world to trust them heading into this match-up and the public jumped all over it, making this one of the heaviest-bet games of the weekend. But wait, not so fast my friends. If everyone is betting on Syracuse, why is the spread moving in PITT’s favor? Because smart bettors like us are throwing the house on the Panthers. Ride with the professionals and take the Panthers at home. I don’t live by many rules, but this one I refuse to break. Always bet the under when two service academies play. Without diving into the specifics, think about this, service academies are built on tradition. They keep coaches as long as they can. They love running the football, even though every other team in football highlights the pass. The pride of not only a school, but a wing of our military is on the line; these guys give everything they have in these games and that usually translates to a defensive battle. It’s hard to believe, but Kentucky enters this game 5-0 and ranked No. 13 in the country. No, this isn’t basketball, but BBN has looked for real in the early going. The Wildcats defense has been insane in their past three games, not allowing more than one touchdown. They thrive on getting to the Quarterback, causing pressure that turns into turnovers. However, they have not faced a mobile Quarterback like Texas A&M’s Kellen Mond. I expect him and one of the most balanced offensive attacks in the country to make this a long day for the Wildcats. Kent read, Kent write, Kent win the game we needed to complete last week’s ML Parlay, Kent State. So we’re getting a little crazy with this one. $5 to win $3000. As I previously mentioned, I have a fiance now. I need money and I need it yesterday. We’re back on top this week…sporting a record of 3-2 and missing the $5 parlay by ONE DAMN GAME! At any rate, Mr. John Bray was on the road in Charlotte this week, so we’ve decided to invoke some southern style into our libations as we prepare to either celebrate our triumphs or drown our sorrows. For the Winners: As always, we like to class it up a little bit when we’ve had a good week, so I nominate the Bourbon Iced Tea to serve that duty. The recipe is fairly simple: 2 parts bourbon, 2 parts simple syrup, 4 parts iced tea, a squeeze of lemon juice, ice, and garnish with a mint leaf. You can find the actual recipe here. As with most cocktails, choosing a quality spirit to yields the best results, but using high quality spirit is just a waste of really good booze. So shoot for a nice Buffalo Trace or something similar. Seriously, if I hear about anybody using Pappy Van Winkle in this cocktail, I’m personally giving the big guy with the tire iron your address. For the Losers: I’m not saying that consuming this beverage makes you a loser, but I’m not NOT saying it either. It’s not fancy and it’s just as at home at the tailgate party as it is at the golf course. 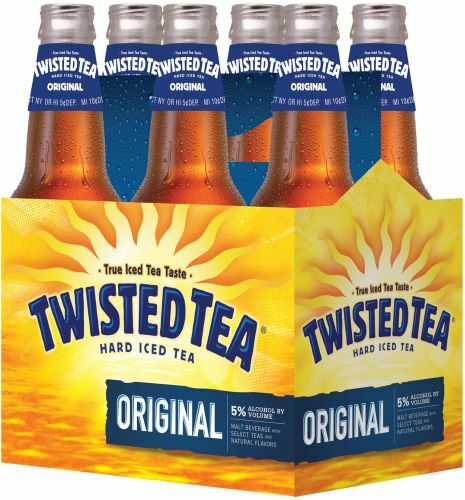 That’s right, I’m talking about good old Twisted Tea. Don’t be fussy here. You lost a lot of money this weekend (probably from advice given in this column). Bottles…cans…variety…none of it matters. Just make sure these babies are good and cold and you’re home free.